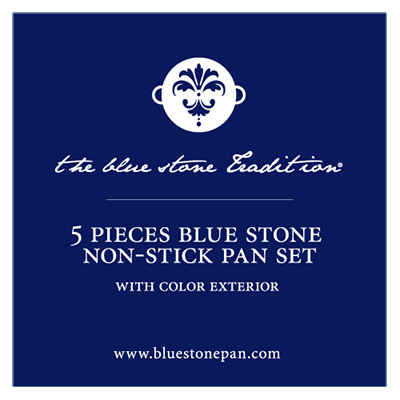 The new Blue Stone Pan® pan set has been designed according to our aesthetic line. Smooth edges, ergonomic handles and our special Blue Stone™ coating. TheBlue Stone Pan® pan set includes three pans compatible in size with the great majority of stoves: one with 20cm diameter, another one of 24cm and another one of 28cm. Our famous Blue Stone™ coating makes it easier to use and maintain our pans and extends their useful life. The Blue Stone Pan® pans are made of high quality aluminium with a special non-sticking coating. Easy to clean and washable in the dishwasher. Now Blue Stone Pan® also available in black. Cook in black elegance with this 3-piece set. We are aware of the fact that meals have different textures and flavours depending on the stove on which you cook them. That is why we want the chef to take that decision. Our pans will work on any kind of stove: glass-ceramic, induction, gas or electric stoves. Blue Stone Pan® all rights reserved ®2014. Contact. Please fill in the following form in order to contact our offices. All fields are required. Do not forget to check your details before sending the form. Message received. We will soon contact you. The message could not be delivered. Please try again in a few minutes. If the problem persists, please write to us directly at info (at) bluestonepan.com Please check the provided information.